Why are we usually expected to make an economic argument to justify conservation? If you have a spare moment, listen to the latest “Life Scientific” on BBC Radio 4 (28 min-long podcast from Nov 11 is available here). 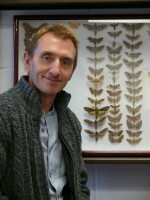 It is a fascinating and heart-warming interview with prof Dave Goulson, a British biologist and conservationist who specialises in the ecology and conservation of bumblebees. Prof Goulson talks about his lifelong obsession with animals, from insect to road kill – hats off to his understanding parents for tolerating the unusual hobby of collecting all sorts of animals (live and dead) or practising taxidermy at home. In 2006, he founded the Bumblebee Conservation Trust, a charity devoted to reversing bumblebee declines. You can make a donation to the Bumblebee lab’s research on bee ecology and conservation. His research – revealing that the use of pesticides called neonicotinoids is affecting the bumblebees – has contributed to the EU-s temporary ban on the use of the three neonicotinoids-containing pesticides. This has thrown him into a political storm: the UK government hasn’t accepted the research, and the farmers argued that the ban is detrimental to their harvest. Stumbling inadvertently into the world of politics and big business has required Prof Goulson to explain, over and over again, why it matters (that the population of bees is declining) and why we shouldn’t drive them to extinction. And he always seems to be expected to back his explanation with economic arguments. He explains that humans depend on crops pollinated by bees (about ¾ of all the crops that mankind grows are pollinated by insects; without bees our diets would be pretty poor). He points out that a simple answer that they have a right to live (or that humans have no right to kill them) doesn’t seem to be enough. And he is getting fed up with having to make an economic argument to justify conservation. So should conservationists, scientists and policy makers rely on the economic benefits to explain, and get the locals’ support, for conservation? Should any cultural values be taken into account? What about intrinsic value as the right basis for conservation? I will explore this issue in my next post. This entry was posted in Uncategorized and tagged Bumblebee Conservation Trust, conservation, Dave Goulson. Bookmark the permalink. 3 Responses to Nature conservation – why, actually? Thanks for this post Marta. I too heard the programme and it was so good to hear such a quietly powerful, rational voice speak out AGAINST this perpetual use of the economic argument to justify withdrawal for environmental concern. There is a much bigger picture here – it’s called planet Earth! Yes, and we only have one planet Earth but act as if we had many at our disposal. Thank you for your comment. I will post something on the same topic tonight.